For truly sensational wedding flowers, work with your florist to turn your floral fantasy into a stunning reality. Your first step to floral perfection is to find a good florist. Flowers set the style for the entire day, so this is an all-important partnership. You are looking for someone who’s in tune with what you like and who will bring a sense of style and drama to the whole occasion. The florist is one of your most important wedding suppliers and you should expect to visit at least three to discuss your ideas. The trick is to find someone who can make your dreams come true without blowing your budget. Look through this magazine to find florists in the area close to the wedding venue, and ask for recommendations from friends or other suppliers, such as your venue or photographer. Make appointments with your shortlist of favourites, avoiding Saturdays when staff maybe hectic preparing other wedding arrangements. Arm yourself with details of your wedding (the date, the venue, style of gown, theme and some idea of what you’d like). It is also important to have some idea of how much you want to spend. As a rough estimate, 5% of your total wedding budget is the average spent on flowers. At this initial meeting, try and give the florist a good idea of the type of blooms you like as well as a general insight into how you envisage your big day. A good florist should be able to come up with designs you love that suit your wedding while remaining within your budget. You can book your florist anything up to a year in advance of the wedding and you should expect to pay a deposit at the time of booking. Start discussing details about three months before the wedding, finalising your choices about three weeks in advance. Are you right for my wedding? When you’re visiting your florist, take along a list of questions. Do you have photographs of your work, especially other weddings you have done at my venue? Which flowers will be in season for my wedding? How can I make my budget go further? Do you offer items such as vases and candelabras? Can they be hired or do I need to buy them? Will you personally be doing my flowers? When do I have to finalise all the flower choices? What would the timetable for the delivery of flowers be on the day? Do I need to leave a deposit now and when is the balance due? Creating a floral extravaganza with a large budget is easy, but if you don’t have a lot to spend, you shouldn’t have to compromise on style. Obviously, the easiest way to save money is to have fewer flowers, particularly fiddly, time-consuming table arrangements, but there are other ways you can cut costs. Stick to seasonal flowers. Varieties that are out of season will have to be imported or grown in greenhouses so are generally more expensive. Don’t dismiss “common” flowers, as they can look stunning. Daisies, for example, can be made up into eye-catching – and inexpensive – pomanders for all your bridesmaids or used as modern centrepieces. Other ways of saving include using the ceremony flowers at your reception, enhancing larger flower arrangements with pretty foliage and giving your bridesmaids single flowers to carry instead of posies. Fill the room with a wonderful fragrance. Ask your florist about using scented flowers such as lilies, hyacinths, frangipani, mimosa, stocks, jasmine and sweet peas. 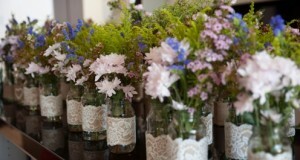 While the main aim is to choose flowers in a colour that you like, there are other factors to take into consideration. Think about the venues where you will be holding your ceremony and reception. If you love the idea of soft pink flowers but your venue has a scarlet patterned carpet, you might need to rethink your colour scheme. Also, if your venue is modern and minimalist, delicate country flowers in pastel shades could easily look out of place, while arrangements of striking white lilies would be ideal. The simplest solution to setting a theme is to go with the season. Spring and summer demand soft, pastel shades, in particular pink, and lots of white. An autumn or winter wedding, allows you to choose opulent, richer colours. Reds, splashes of vibrant orange mixed with foliage and lots of candlelight will certainly look dramatic. Before you speak to your florist it’s important to make a list of all the areas where you would like to include flowers and then, between you, decide on suitable designs and arrangements for each one. 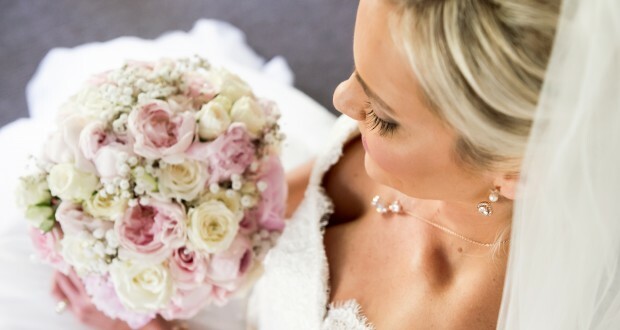 Try to visualise the ceremony, reception venue, your bouquet, bridesmaid’s flowers, buttonholes, corsages and other accessories, writing down the flower requirements for each one so you can chat your ideas through with your florist. If you’re having a church wedding, the church may have a florist, or you may decide to use your own. Consider having pedestals at the front of the church and perhaps some flowers at the end of each pew. You might also want to decorate the entrance to the church where many of the photographs will be taken, and provide cones of fresh petals for your guests to throw as confetti. 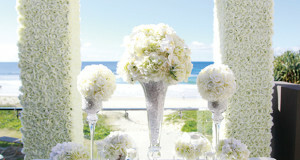 If you’re having a beach ceremony, your bouquet can be used as a table arrangement where you say your vows. Once this part of the wedding is over, you can move the floral arrangements from the ceremony into the reception area, instantly halving your flower costs. The room where the reception is being held is the place to splash out on flowers since it is the place your guests will be spending the most time. First impressions count so the entrance needs to be welcoming, drawing your guests inside. A floral pedestal on either side of the door is ideal or you could frame the door in tulle decorated with a single garland, which looks effective and is inexpensive. Keep table arrangements either low, so that guests can talk over them, or in tall vases so that they can talk under them. Fresh rose petals can be scattered over tables, small arrangements can be tied to the backs of chairs, flower heads can be suspended in vases of water surrounded by floating candles, and individual flowers can be tied to napkins as favours. Don’t feel that you have to cover every available surface with flowers. Clever positioning and using displays of varying heights can create a feeling of lots of flowers, even when there are not.